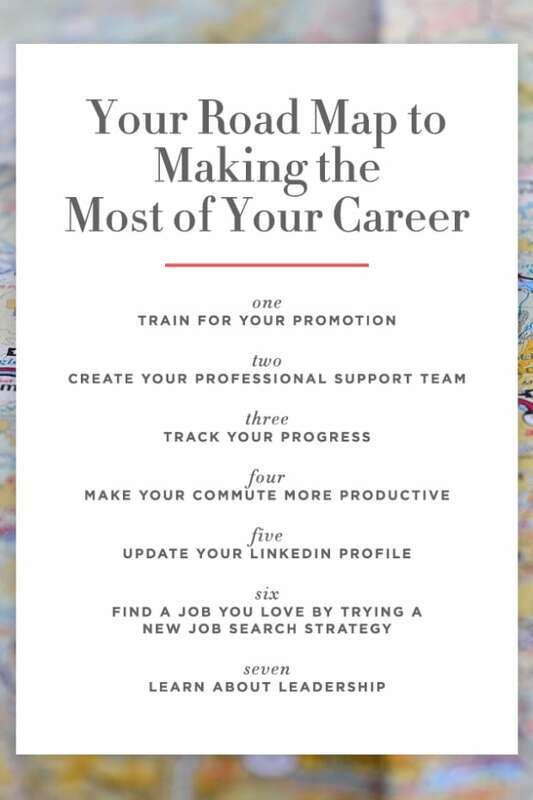 Your personal toolkit for getting the most from your job this year. There’s nothing quite like the start of a new year. 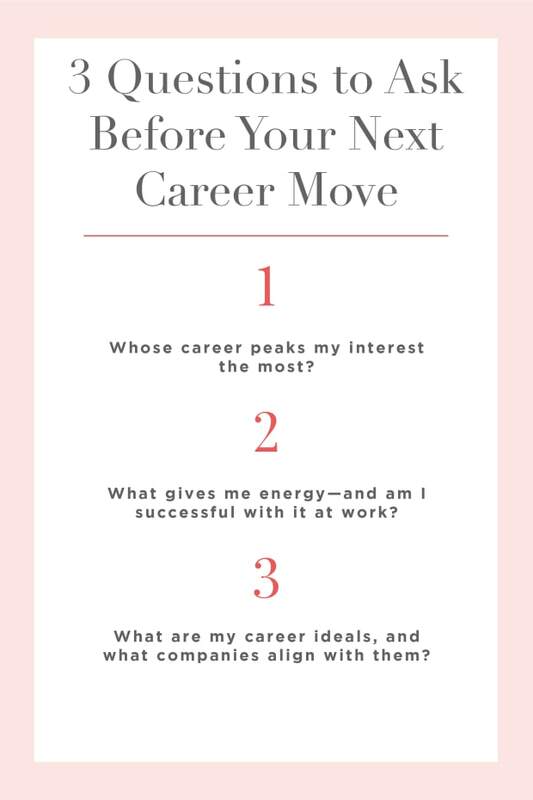 It’s a time for reflection, a mental refresh, and the kick-in-the-pants you need to make a plan that helps you consciously move forward toward the career goals you want to accomplish. 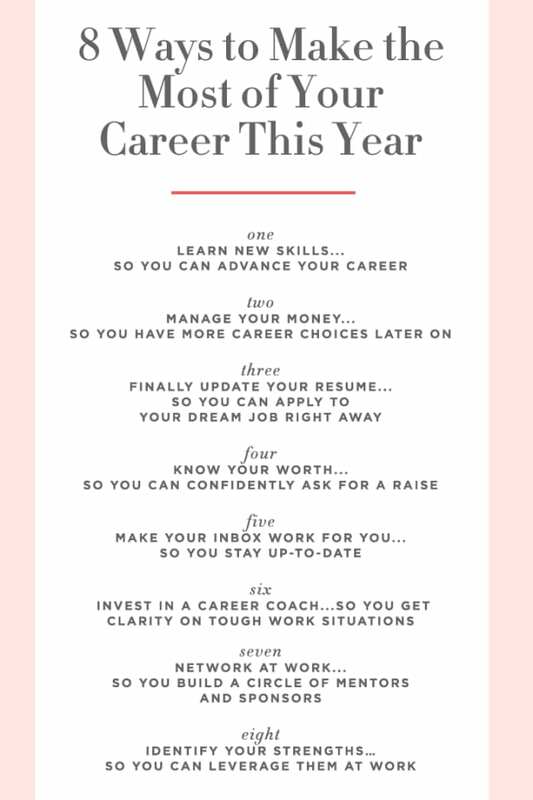 It’s true that many of us look at January 1st and think, “I’m ready to do alllll the things,” but overcommitting is not going to help you make the most of your career this year. 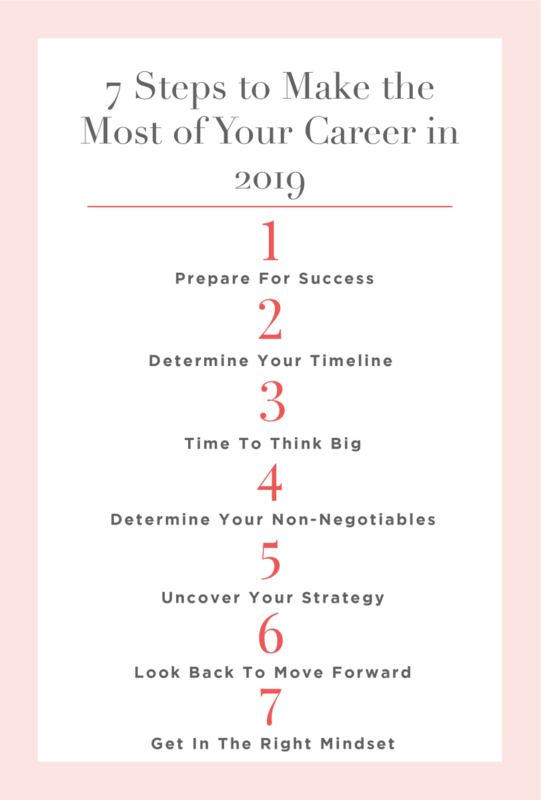 Making the most of your career in 2019 will require careful planning so allow me to provide an outline to help you get there—and eventually get all (yes, alllll) the things done. The first thing you’ll want to do is set aside some dedicated time to make your plan. Pick a time and place where you’ll be distraction-free. I like to go to a public library on a weekend morning. Next, collect as much information about last year’s career performance as you can. For example, what was your salary, job responsibilities, accomplishments, projects you enjoyed, projects you hated, projects you didn’t have time for but wish you had, etc. Gather as much as you can before you march off to the library. Depending on your personal situation, it may be best to set goals for 3, 6, 9, or 12 months. If you work for a large organization and things move a bit slower, you might select 9 or 12 months for your timeline. If you work for yourself and have a lot of personal control over your daily tasks, maybe set goals for 3 or 6 months. Without thinking about any details or cutting off ideas for any reason, write down all the things you want for your career this year: Do you want to find a new job? Do you want to transition to a company you’ve admired for a long time? Do you want to make a big move? What about starting a side-hustle or getting the promotion that leads to you managing a team? Whatever it is, write it down (this worksheet can help!). These are the things you’re unwilling to do or experience in order to reach your goals. Ask yourself, “What are the things I no longer want to experience in the future?” For example, maybe you’re not going to allow yourself to make excuses for why you’re not scheduling regular check-ins with your boss. Or, you’re no longer going to take on additional projects at work out of fear of saying no. Another non-negotiable example is not following through with uncomfortable actions like asking a stranger for an informational interview. And my last non-negotiable example is getting your savings account in order. You no longer want to have another year where you’re not building a savings fund. I think you’re starting to get the point of this list. Take time to see what areas, tasks, relationships, and more need to be removed in the new year. In order to accomplish goals, we need a strategy. This applies to all people—not just CEOs and business owners. Treat your career like your own personal business venture. Based on the goals or outcomes you want to reach, how will you get there? 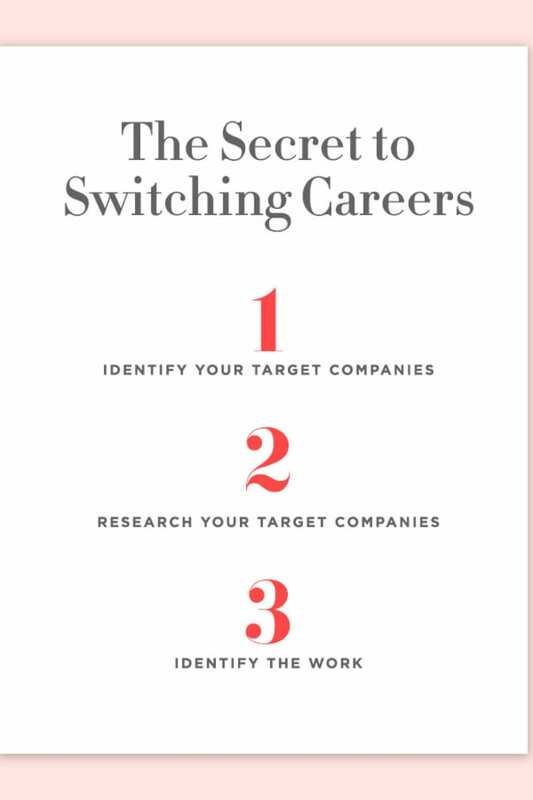 Let’s use the example of having a goal to transition your career. You want to move from finance to social media marketing. What’s your strategy for making that move? Do you need to learn new skills? Create a new resume? Network? Do you need to create a portfolio site that shows off your ability to market something through social media? Or maybe you want to develop a woman’s resource group at work. What do you need to start with to get the group formed? Do you need to set up a meeting with your managers, survey the company for interest, etc. Your strategy should be specific, attainable, and include deadlines for the tasks. While you’re polishing the details of your strategy, look back on past wins and failures as they relate to your strategy and more narrow list of goals. What things in the past were really challenging? What strategies in the past didn’t work out? Consider your past performance to help refine your strategy. At this point, you should have more clarity around what you want to work towards in 2019, as well as why and how. Now you have to make sure your mindset is in the right place because this matters... A LOT. Having the right mindset and being kind to yourself along the journey of accomplishing these goals will take your far—a whole lot further than letting your inner critic creep in (I highly recommend listening to this podcast episode for more information on this!). I’d love to hear your tips for planning and setting career goals. Let us all know in the comments below!